The Museum of Cycladic Art has published a volume, Aegean Waves, to celebrate the twentieth anniversary of its foundation. It is beautifully produced, with colour illustrations, and is "addressed ... principally to the general public". this is indisputable evidence that the aforementioned part of the "Keros Hoard", that seems to have been smuggled out of Greece and sold abroad as a group, does indeed come from Kavos on Keros. While the joins do indicate the connection for these pieces, I remain to be convinced that every piece associated with the "haul" was found in the same location. And parts of the "Keros haul" continue to be displayed in public exhibitions. There was certainly an international market for Cycladic figures and the fragmentary male figure (no. 30; inv. no. 969) once graced the cover for Antiquities from The Erlenmeyer Collection, Sotheby's (London), July 9, 1990. Aegean Waves also illustrates a "Double marble figurine of unknown provenance" (p. 44, fig. 50). This featured in the Katonah Museum of Art's 2006 exhibition, Ancient Art of the Cyclades (no. 15, "mother-and-child composition") where it was listed as "Private collection, New York". This figure with "unknown provenance", or to be more precise "unrecorded find-spot", had in fact appeared in two other exhibitions: Early Cycladic Art in North American Collections as "Standing female two-figure image" (no. 18, "Collection of Shelby and Leon Levy") and Glories of the Past: Ancient Art from the Shelby White and Leon Levy Collection as "Two joined standing female figures of marble" (no. 9). Is this the sort of piece the authors of Aegean Waves had in mind when thinking about the sort of figures that have been sold on the "international market"? The Museum of Cycladic Art has a very fragmentary example illustrated here (no. 41; inv. no. 339). But was the market only international? One can only guess at the cost of forming the Goulandris collection in terms of archaeological sites destroyed and information lost. Christopher Chippindale and I have explored the extent of the loss of information in our study of the "Material and intellectual consequences of esteem for Cycladic figures" (a work unreferenced in Aegean Waves). There is, however, an oblique reference in a discussion of marble figures attributed to the "Goulandris Sculptor" (no. 29). Other scholars ... are of the opinion that these views carry the implication of artistic principles, aesthetic perceptions and social structures that are not consistent with what is known at present of Cycladic society in the 3rd millennium BC. They believe that the manner in which Cycladic figurines were made may have derived from a combination of a general sense of the proportions of the human body and the application of basic design principles that were established by centuries of repetition. The similarities between some of the figurines are attributed by them either to the existence of local workshops and traditions, or to the fact that they express a particular period. The loss of archaeological contexts through the desire of collectors and museums to possess Cycladic figures has meant that the means of exploring such regional workshops has been lost for good. Looting has had serious intellectual consequences for the study of Early Cycladic Culture. Bothmer, D. von Editor. 1990. Glories of the Past: Ancient Art from the Shelby White and Leon Levy Collection. New York: Metropolitan Museum of Art. Doumas, C. G. 2000. Early Cycladic Culture: The N.P. Goulandris Collection. Athens: N.P. Goulandris Foundation - Museum of Cycladic Art. Elia, R. J. 1996. "A seductive and troubling work." In Archaeological Ethics, edited by K. D. Vitelli, pp. 54-62. Walnut Creek: Altamira. Getz-Gentle, P. 2001. Personal Styles in Early Cycladic Sculpture. Madison: The University of Wisconsin Press. ---. 2006. Ancient Art of the Cyclades. New York: Katonah Museum of Art. Getz-Preziosi, P. 1987. Sculptors of the Cyclades: Individual and Tradition in the Third Millennium BC. Ann Arbor: The University of Michigan Press. ---. 1987. Early Cycladic Art in North American Collections. Richmond: Virginia Museum of Fine Arts. Gill, D. W. J. 2002. Review of P. Getz-Gentle, Personal Styles in Early Cycladic Sculpture (Madison: The University of Wisconsin Press, 2001). Bryn Mawr Classical Review. Renfrew, C. 1991. The Cycladic Spirit: Masterpieces from the Nicholas P. Goulandris Collection. London: Thames & Hudson. Sotirakopoulou, P. 2005. The "Keros Hoard": Myth or Reality? Searching for the Lost Pieces of a Puzzle. Athens: N.P. Goulandris Foundation - Museum of Cycladic Art. Stampolidis, N., and P. Sotirakopoulou. 2007. 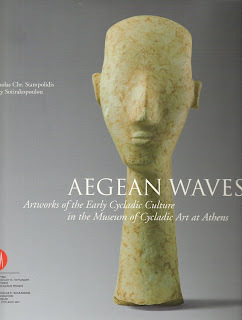 Aegean Waves: Artworks of the Early Cycladic Culture in the Museum of Cycladic Art at Athens. Milan: Skira.